This sleek and contemporary Elmsley patio set creates the perfect outdoor dining setting. The Elmsley 5-piece sectional set features 4 sectional chairs and 1 storage table. Relax in the cozy CorLiving Park Terrace Collection this summer. Our textured black resin rattan weave is complimented by high quality, weather resistant foam seat cushions wrapped in zippered and washable teal covers. Stretch out on the easy to arrange sectional or put your feet up on the ottoman while sitting in the deep backed corner chair, the options are countless. With our clever design, the ottoman can easily be used as a coffee table. Ready to use upon delivery, you can complete your summer with this comfortable patio set from CorLiving. Relax in style and sophistication, and enjoy the outdoors with the Beacon Park 3pc sectional set. A sturdy, rust-resistant frame supports intricately woven, rich brown wicker, and features a plush olefin seat and back cushion. Wide, curved armrests ensure maximum comfort you won't want to give up. Use as a standalone piece, or include other Beacon Park furniture elements to create a complete look. Enjoy your outdoor space with the Hampton Bay Laguna Point patio furniture set made with beautifully hand-woven wicker and durable steel furniture frames. The patio chairs boast deep, plush weather resistant cushions for ultimate comfort and longevity. The coffee table has a tempered glass inset and handy bottom shelves for extra storage. Perfect for your porch, patio or sunroom, each patio furniture set includes one left/right arm chairs, one middle chair, one corner chair, and one coffee table. Relax in the cozy Sonax Park Terrace collection this summer. Our Saddle Strap Resin Rattan Weave is complimented by high quality, weather resistant foam seat cushions wrapped in zippered and washable Coral Sand covers. Stretch out on the easy to arrange sectional or put your feet up on the ottoman while sitting in the deep backed L chair, the options are countless. With our clever design, the ottoman can easily be used as a coffee table. Ready to use upon delivery, you can complete your summer with this comfortable patio set from Sonax. Elmsley 5-Piece Outdoor Sectional Set This sleek and contemporary Elmsley patio set creates the perfect outdoor dining setting. The Elmsley 5-piece sectional set features 4 sectional chairs and 1 storage table. 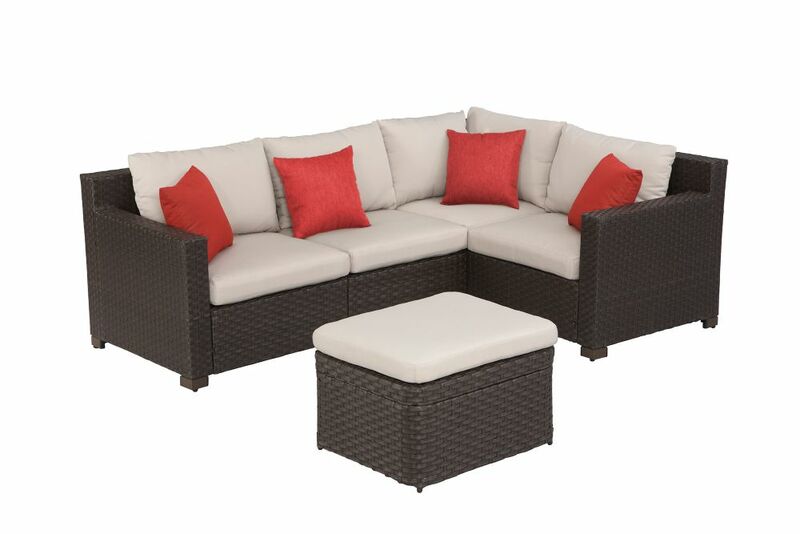 Elmsley 5-Piece Outdoor Sectional Set is rated 4.7 out of 5 by 40. Rated 5 out of 5 by Goldsmith from Elmsley 5-Piece Outdoor Sectional Set Easy to put together and is a great quality for the price! Love it! Rated 4 out of 5 by BGBub from Good deal, great set! We bought this set the beginning of July and have been able to enjoy it for the summer. The quality is good, it's sturdy, comfortable and we love that we can separate the set if we want. There's also a bit of storage in the ottoman, which is nice. It's great for the price, exactly what we were looking for. Only issue was the delay in receiving it and nobody being able to give us a straight answer as to where it was, as the tracking number was apparently incorrect. A bit of a run around but Home Depot was very apologetic and made up for it so they turned a negative experience into a good one in the end! Rated 5 out of 5 by Angela from Great product I bout this a few weeks ago and love them. Easy to assemble and very sturdy. The rain beads on cushion and can be dried off or shake them. Very comfortable and I like that the Centre table has a storage compartment. I have been trying to buy just one chair to make it a bit bigger but have not been able to find a way to do so. If I can get another chair would love to hear from someone. But great set. Rated 2 out of 5 by Toni from Small set My set arrived when I was away. Hubby set it up and threw away the boxes. I could see it was so small that only two people could sit on it comfortably, not four. I spent a lot of time trying to purchase a single seat with no arms to make it longer but to no avail. Sadly I am stuck with a set that only two people can sit on and can't purchase extra pieces. Home Depot.....please help!! Rated 5 out of 5 by Review from LOVE IT It's great coming home and lounging on this comfortable L shape patio set. For the price and the added storage bonus in the ottoman makes it all worth it. Rated 5 out of 5 by Rod B from Great Value!! Compared with similar models advertised, I feel this purchase was an excellent deal. Setup was reasonable, and it appears to be made of very good materials. I have enjoyed my backyard much more since this purchase. Rated 1 out of 5 by James from Rust never sleeps. This sectional started to rust after less than 2 weeks in normal spring weather conditions. The under frame collects water and drips brown rusty water onto the deck. The stains are not removable without sanding and refinishing. I do not recommend this product. Rated 4 out of 5 by Rosie from Very happy Easy to assemble and great value. Happy with delivery service. Can this sectional be reversed to the other side? Why are the reviews about a table and nothing about the actual set (seats)? Is each chair 30 inches in width for a total of 60 x 90 inches (for the configuration in the picture)? Are other configurations possible? Can you get replacement cushion covers for this set? We bought the set last year and the zipper ripped on 2 of the cushions. Wife and I like the patio set, we were wondering if we can buy one more chair (the one in the middle) as we have big patio and need one more people to sit. Please let us know where we can buy extra chair exact the same as this Elmsley style. Can I purchase a chair piece without arms to make sectional longer? I would like to buy more pieces - where would I find them?